Important: the Virtual Foundation no longer maintains a network of projects in a variety of countries looking for support, as we do not have the capacity to screen or implement them. Please note that we can no longer accept unsolicited proposals, no matter how worthwhile. On this website, we maintain documentation of a fascinating variety of 90 small-scale funded projects, and also three larger regional grant-making programs. The Virtual Foundation, founded in 1996, was the first online philanthropy program designed to support grassroots initiatives around the world. It provided a platform for specific projects designed by local community groups and non-governmental organizations. met locally identified needs directly and on an appropriate, sustainable scale. However, our model relied on the Consortium Members - established support institutions on the ground in each country or region - that provided services (translation, communication, banking etc.) to local groups. We were unable to sustain this model over the years. Following the September 11, 2001 attacks, and then the 2008 economic crisis, our Consortium Members lost much of their own support, and had to shut down their services to local groups. In addition, larger development funding organizations increasingly want to implement their own agendas rather than relying on local initiatives. The Virtual Foundation maintains its fiduciary mechanism for support of a limited number of ongoing projects that have their own dedicated funding sources, and for which we can assure our responsibility and oversight. For more on the ideas and experiences of ECOLOGIA, and reflections on the power of community-based grants, see "From the Baltic Mini-Grant Program to the Virtual Foundation: Small Grants and Global Change". Goals:: Nomads help preserve the planet with their low-impact lifestyle, which uses few of the earth's resources. With their strong connection to and respect for the earth, their lives can teach others the art of sustainability. 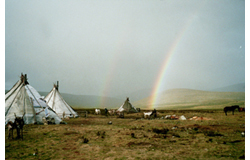 In the past 50 years, though, nomads in Mongolia have decreased from nearly 100% of its population to 38% today. There are many forces causing this: more health and education opportunities in the city, damage to traditional lands due to mining and construction, lack of support infrastructure, and climate change leading to stress on plants, animals and people. As fewer nomads continue the herder lifestyle, it is essential that their ways and heart songs be saved for future generations. The Nomadicare team, led by Sas Carey, documents the lives of the nomads in movies, on video, with still photographs and with printed stories. The nomads themselves are showing resilience, as they appreciate seeing the stories of their own traditions, now being made available to the outside world.